One of the most beautiful and exclusive of Mexico places is Los Cabos, located in Baja California Sur (being one of its five municipalities), in the South of the State. 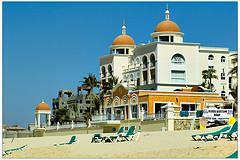 Its most important city is Cabo San Lucas, one of the most important tourist destinations in all Mexico. This city offers various activities throughout the year. Not only by being Beach means that activities in the winter can do, for example, during this season of the year may be one of the most beautiful natural phenomena, which is courting, procreation and birth of the gray whale. Also has many activities in the summer, such as kayaking, diving, fishing and the visit of its secluded beaches, from where you can appreciate the monumental arch, an arch recently declared world heritage by Unesco, with rock formation which has been sculpted by the sea by the passage of time, where cross the Pacific Ocean and the sea of Cortez. Also between Cabo San Lucas and San Jose is located the tourist corridor (33 km in length) the which is a very touristic place, where you can find world-class hotels, which celebrities visit very often.